Who doesn't get revved up for a fabulous giveaway? There's so much to get excited about: pretty stuff for free. This time from one of our favorites Tessa Kim. 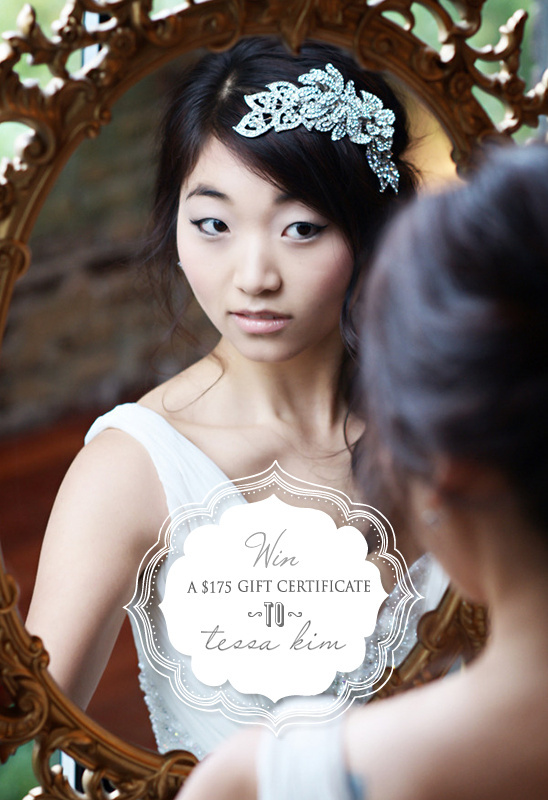 Two lucky readers will win a $175 gift certificate from Tessa. 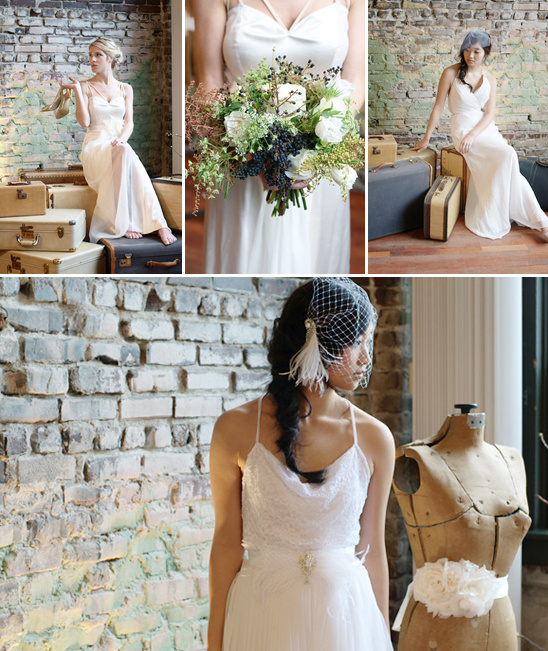 In honor of this exciting giveaway, Tessa and Deyla Huss collaborated on vintage-inspired shoot to showcase The 2012 Tessa Kim collection. You can see more of the shoot by clicking here. 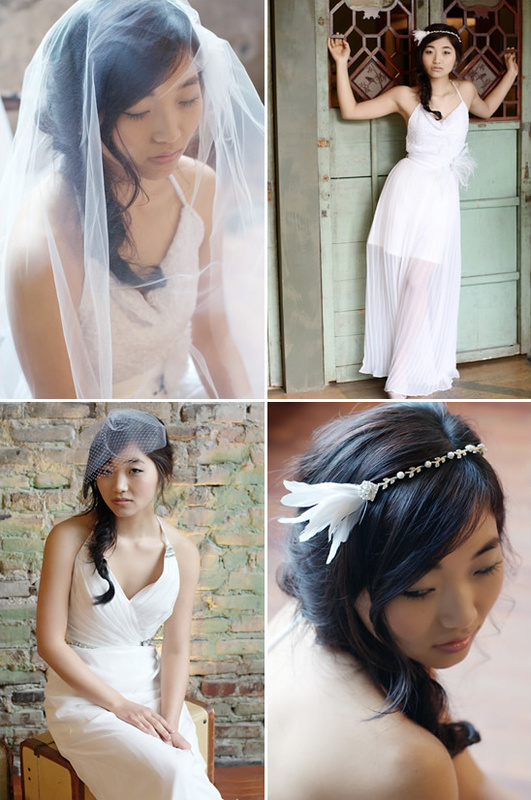 In order to win of one of gorgeous headpieces, dress accessories or veils you need to peruse around Tessa Kim's online shop and come back to Wedding Chicks and leave a comment on your favorite item. Enter as many times as you like winners will be announced Next Wednesday March 14, 2012. Once chosen, the winners will have exactly one wek to claim their prize or new winners will be chose. From Tessa:I created these dress sashes and rhinestone adornments to compliment the the gorgeous dresses of Miss Tashina and Bonny Bridal. All of the dress sashes were created with hand painted and shaped flower adornments, multiple rhinestones and vintage lace which really complimented the simplicity and vintage elegance of the Miss Tashina dresses. The rhinestone headpieces were created to adorn the modern and sleek Bonny bridal dresses. For this photo shoot we really wanted to capture the essence of vintage glamour, from the props used to the stunning location. All of the accessories were created with a vintage heart in mind.